JAMES T. GILL joined us in September 1984. He received his Bachelor of Arts Degree in 1979 from Seton Hall University and his Law Degree from its School of Law in 1982. He served a judicial clerkship for the Honorable Robert Gaynor, Superior Court of New Jersey, Somerset County and, thereafter, joined a general practice firm for one year. Since joining our firm, where he is now a partner, he has been engaged in all aspects of the defense of litigation, having tried many and varied cases to conclusion. These include defense of engineers, oral surgeons, insurance brokers, automobile operators, commercial and residential property owners, as well as the manufacturers of various products. 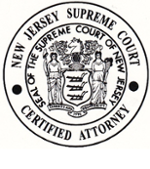 Mr. Gill is admitted to practice law in the state and federal courts in New Jersey, the United States Court of Appeals, Third Circuit, and the Supreme Court of the United States. He is Certified as a Civil Trial Attorney by the Supreme Court of the State of New Jersey, is a member of the New Jersey State Bar Association, the Morris County Bar Association, the Middlesex County Trial Lawyers’ Association, the Defense Research Institute, and is a multiple honoree as a "Super lawyer" and “Top Attorney in New Jersey” as published in New Jersey Monthly Magazine. Also, he is consistently rated AV Preeminent by Martindale-Hubbell.